BMW F800S ✅ of BMW motorcycle was developed as sporty motorcycle, which is route suitable. With 85 HP from the 2-cylinder-engine the fun comes never too briefly and by the belt drive maintenance is reduced to a minimum. By the excellent chassis and the perfect vote on this motorcycle, a machine is created for handiness, perfect for its lovers. 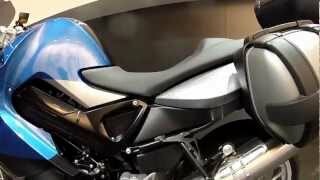 BMW F800ST has a larger cover panel, a higher windscreen and offers more comfort on longer routes. Naturally both BMW F800S and BMW F800ST with ABS are available. To adapt both BMW models individually with your needs we have a great assortment of products. For still more route fitness we offer different products, begun with the suit-case, tank backpack over tail bag up to topcase bag and adjustable footrests and/or lowing down footrests. For longer routes the superbike handlebar as well as the crashbar are likewise very meaningful to protect your motorcycle optimally also with one fall down. Likewise we offer many carbon and GRP products like for example engine spoilers and rear huggers for the rear tire. Also useful products are our windscreens and slip on exhaustst of Remus, as well as LED's, turn signal glasses and TomTom or Garmon navigation equipment. We also have much accessories like for example intercom systems and still more spare parts and wearing parts begun with the engine oil, transmission oil, battery oil filter tool, oil filter, air cleaner, chains, break pads, up to spark plugs. Both with tour and with sport motorcycles the road handling property plays an important role, why we attach very much importance to highest quality with suspension rears and fork springs as well as the suitable tools for your machine.